We will live blog the Budget here at www.bermudasun.bm or you can take part in the conversation at #BdaBudget on Twitter. • There are no new taxes contained in the budget for the fiscal year. • The government believes the planned reduction in spending can be achieved without laying off of workers in the public sector. • Having said that, there may be job cuts on the horizon. The government says reductions in costs after 2014-2014 will not be possible without either staff layoffs or the outsourcing of noncore functions through mutualization or privatization. “Remaining as we are, with the current number of civil servants, will not be possible,” said Finance Minister Bob Richards today. • The number of unemployed in Bermuda decreased from 3,305 in 2012 to 2,569 in 2013. • The budget is projected to have a deficit of $267.3 million, which represents a 19.4 per cent — or $64 million — in deficit reduction. • Gross public debt as of March 31 will stand at $2.3 billion, by March 2015 that number is expected to be $2.1 billion. 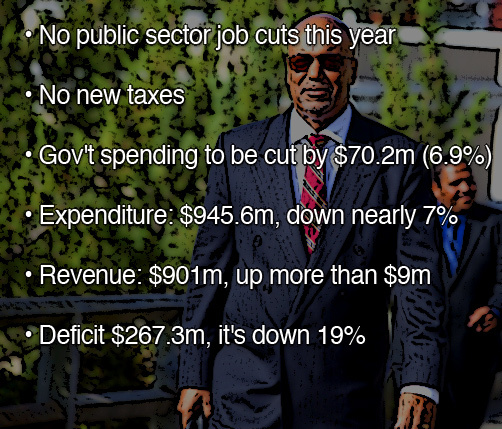 • Government spending is to be cut by 6.9 per cent, or $70.2m. • The government will consider mutualization, outsourcing or privatization for many public departments, including airport operations/causeway, emissions and vehicle testing, aircraft registry, ship registry, CITV, waste management, vehicle and equipment operations, GEHI and health insurance department, parks maintenance, water and sewage, social insurance, high maintenance and conservation services. • New company registrations in Bermuda increased from 147 in 2012 to 180 in 2013. • Government has engaged in talks with Morgan’s Point Ltd. and is near reaching an agreement with that company that would amend a previous government pact with an eye to develop and remediate that property. • Mr. Richards criticized the 60/40 ownership rules, saying such regulations “hinder the inflow of investments that are needed today to power recovery that can restore hope, opportunity and jobs for our people.” He suggests the rule will need to change to foster economic growth, but does not go into specifics. • Last year, France placed Bermuda on a fiscal blacklist in an effort to crack down on tax evasion. The move cancelled more than $40 million worth of French reinsurance contracts with Bermudian companies. • The government will introduce the Public Bodies Reform Act, which would establish a legal authority to abolish, merge, modify or transfer various public and government entities. • While there are no anticipated public sector job slashes for the year, Mr. Richards says spending cuts must happen if the country is to retain confidence of international investors and maintain financial independence. • Mr. Richards says the island needs to look at ways to make Bermuda more attractive to the reinsurance industry, which has a grim outlook, according to Wall Street analysts. • Mr. Richards said labour unrest could dampen prospective hotel and airport development. • Casino gaming is central to the government’s tourism development initiatives.